Dive into the blue waters of the Med for a life-changing experience! Discover our Friends’ Corner (Coin des Copains) – a campsite within the campsite perfect for groups! If you’re travelling in a small group or group of 40 or more, we offer large mobile homes to guarantee you a comfortable stay in partnership with the scuba diving clubs of La Londe-les-Maures and Hyères in the French Riviera. The Campsite also offers plenty of handy extra services such as breakfast, dinner, cleaning etc. Last but not least, accompanying persons who don’t dive can enjoy our heated pool and the many amenities on offer at “Camping de La Pascalinette”, for a guaranteed delightful stay! And when you get back from your diving adventure, you’ll appreciate the comfort of a four-star campsite and the tranquillity of the off-season months. Scuba diving is open to children aged 8 years upwards. Maiden dives take place in 0-6 metres of water. Budding divers are naturally accompanied by a qualified instructor. You can take your Level 1 certificate at a local diving club in one week. This will allow you to dive to depths of 20 metres accompanied by an instructor. You can then progress to Level 2, 3 and higher, allowing you to dive up to depths of 60 metres. Divers who have completed their maiden dive and Level 1 certificate but live far from the Var region can opt for a club offering pool training session and outdoor diving experiences in a variety of environments (lakes, sea, etc.). 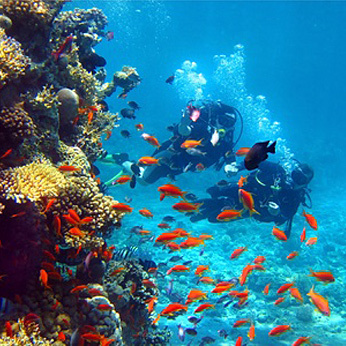 Scuba diving is not recommended for people suffering from respiratory or heart problems. There is no age limit – you just need to be on reasonable form!